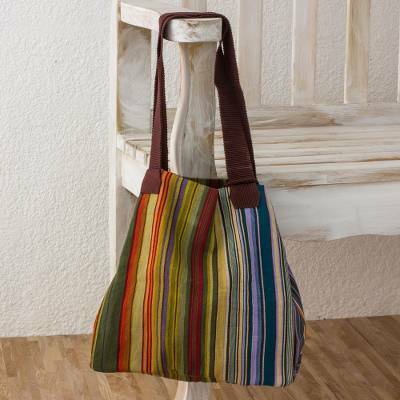 100% Cotton Hand Crafted Colorful Striped Tote Handbag, "Earth and Sky"
Meticulously woven on a backstrap loom, multi-colored vertical stripes form an even pattern across this hand crafted shoulder bag. Women from the Cojolya Association along the shores of Lake Atitlán in Guatemala design this tote with wide straps for comfort. This shoulder bag features a clay bead and loop closure along with an extra pouch. You can find cotton tote 'Earth and Sky' by Cojolya Association in handbags categories such as Hand Woven Handbags, Cotton Handbags and Tote Handbags. Enjoy exploring these sections for other Novica treasures. Love the dark, earthy shades. It is nicely made, not just a side and bottom seam construction. Closure is a clay button with a braided loop. Goes with many fall, transitional pieces, including jeans. This beautiful bag accompanies me throughout the day and brings me peace each time I look at the the array of colors that evoke the earth and sky. It is sturdy and comfortable as well as lovely. The name Cojolya is taken from an ancient Maya settlement. Legend recounts it was here that the Tzutujil Maya artists and sculptors bought their creations to life. The Cojolya Association of Mayan Women Weavers is a non-profit organization located in the Tzutujil community on the shores of the world-famous Lake Atitlan. Since 1985, Cojolya has been providing sustainable, fair trade work to some 80 women who weave using the traditional back strap loom. They have seen their efforts translated into economic stability and enhanced quality of life for their families. The women were born and raised in a Maya community known as the "Bird People." When they were four years old they began to follow in the footsteps of their grandmothers who wove on back strap looms in the patios of their family compounds. They would turn the skeins of threads into balls which their mothers used in warping their weaves. A young girl's first weave is a simple stoij or small head cloth, which is rolled up and used to balance a load on one's head. A young woman's skill is honed until her huipiles (blouses) are adorned with her complex brocades, becoming the envy of the community. The detailed brocades represent the volcanoes, flowers, birds and other animals, and often include symbolic geometric shapes. The brocade was created by Tzutujil women weavers in the early 1930s, when colored threads became readily available. A woman with such skill is in demand to make the finest huipiles for the women of the town. The Cojolya Association was founded by American designer Candis E. Krummel and Tzutujil Mayan, Antonio Ramirez Sosof, who shared a mission to help preserve and encourage this ancient Mayan tradition of back strap loom and provide work for local women. "Arriving in Santiago Atitlan in 1978 on a rainy October night, I awoke the next morning to a gloriously sunny morning, brilliant with raindrops catching the light on every leaf and frond. The tranquil lake was a deep blue, a mirror for the lofty volcanoes at arm's reach from the door of my hotel. The ancient stone streets were peopled with Maya men dressed in purple and white striped pants and elegant women in their hand woven, brocaded huipiles decorated with fantasy birds embroidered in a rainbow of color. Surely I was still dreaming...the beauty of the people and place was surreal. I am Candis Krummel and this was my introduction to the Bird People or the Tzutujil Maya who live on the south shore of Lake Atitlan. No doubt I was enchanted by the magic, as I never left Santiago Atitlan, and some 32 years later still live and design with the women weavers and their back strap looms. Together we create Cojolya's line of women's accessories, plus custom textiles for interiors, and more recently a new line of 'art to wear.' In the ensuing years, I have been privileged to have the opportunity to design with back strap loom weavers in many villages in Guatemala, as well as with Maya women artisans working in a variety of traditional crafts in Quintana Roo, Mexico. I am presently designing with artisans in the Dominican Republic." Each product is meticulously designed by Candis, fusing the skills and techniques of the Mayan loom with color, form, texture, and movement. Combining the finest, eco-conscious materials and innovative textile designs inspired by nature and art, Cojolya creates woven designer accessories, showcasing the structure and diversity of the back strap loom in a style not seen anywhere else in Guatemala. Cojolya collections are inspired by the beauty of the surrounding nature, the colors found deep in the cloud forests on the high slopes of the nearby volcanoes. Their inspiration also springs from other art forms, such as the stained glass work of Louis Comfort Tiffany, and even the sophisticated, urbane look of Italian fashion. These textile creations are a fusion of ancient techniques and contemporary fashion, forming unique, individually-woven, fair trade products. With the opening of a small museum that places back strap loom-weaving on a merited pedestal, the weavers have come to understand that their work deserves the attention and admiration of a world audience. In spite of this and the fact that Cojolya Association is a fair trade organization (which means that their earnings are on a par with teachers' salaries), very few young women are learning to weave today. This art form is now more threatened than ever! In a time of shrinking economic opportunities for young people in Guatemala, a strong Cojolya Association can continue to provide a viable career option for women, bringing more young women to participate in the ancient tradition of back strap loom weaving. "Since 2006, we've been involved in an environmental and health project, where a percentage of our sales supports the installation of Onil stoves for the families in the area, making them more conscious of environmental care and as a result of having less smoke - less pollution - improving health and quality of life, for these stoves use three times less wood than regular fires, so fewer trees are cut in an area that is suffering from deforestation." The name Cojolya is taken from an ancient Maya settlement. Legend recounts it was here that the Tzutujil Maya artists and sculptors bought their creations to life. It is regarded as a magical place of transformation from vision to finished product or work of art. The Cojolya Association mission is to be dedicated to the preservation of the ancient art of Maya back strap loom weaving and the traditions surrounding it – not just as a historic relic, but as a viable economic enterprise for the women who weave. I am amazed and in awe at the beautiful art this woman has created. This bag is sturdy, roomy, strong, and absolutely gorgeous. Plus the fact that our money is actually going straight to the artists themselves and not a bloated, American CEO's salary makes it even more appealing. I love this bag. Absolutely, no regrets! !